WordPress is written using standard compliance high quality code and produces semantic mark up which makes your site very attractive to search engines. By design WordPress is very SEO friendly, and you can make it even more SEO friendly by using wordpress SEO plugins. 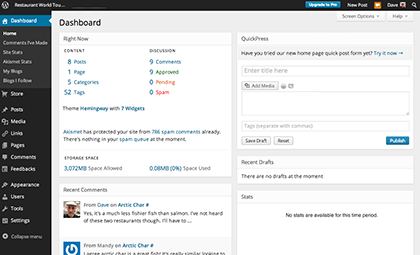 WordPress also comes with built-in updater that allows you to update your plugins and themes from within your WordPress admin dashboard. It also notifies you when there is a new version of WordPress is available, so you can update it by just clicking a button. You can keep all your WordPress content safe by setting up automated regular WordPress Backups.